The Bradac brothers or bratri Bradacove started making cameras in the 1930's. 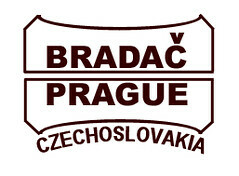 They had a factory in Hovorcovice, Czechoslowakia. Their Kamarad TLR cameras are the first in what was to become the Flexaret TLR series, made by Optikotechna and later Meopta. Financial difficulty forced them to close down their factory. Optikotechna in Prerov then employed both and continued their camera line. In 1946 this company was nationalized and renamed Meopta. French Patent 993761 of 1951, in the names of Jan Bradac and Meopta, Dispositif pour maintenir la synchronisation dans les appareils de projection de films pendant le déplacement de l'image (apparatus to maintaing synchronisation [of the film-advancement mechanism and the aperture] in projection apparatus when the image frame moves), at Espacenet, the patent search facility of the European Patent Office. This page was last edited on 22 February 2015, at 19:15.